Black Bear Hunting - From Maine up to New Brunswick, across all of Canada to British Columbia, Alaska and several Rocky Mountain states, we've compiled a great selection of Black Bear hunts, 124 in total. Black bear hunts from reputable big game hunting guides and outfitters to bag that big bruin for the wall mount or rug for the floor. Guided and self-guided bow and gun black bear hunts. American Black Bear Guide (Ursus americanus)The American Black Bear (Ursus americanus) is the most common bear species native to North America. It lives throughout much of the continent, from northern Alaska south into Mexico and from the Atlantic Ocean to the Pacific Ocean. This includes 41 of the 50 U.S. states, all Canadian provinces except Prince Edward Island, and portions of northern Mexico. Populations in the Southern United States remain in the protected mountains and woodlands of parks and preserves, though bears will occasionally wander outside the parks' boundaries and have set up new territories, in some cases on the margins of urban environments in recent years as their populations increase. The American Black Bear usually ranges in length from 5 to 6 ft and typically stands about 2.5 to 3 ft at the shoulder. Standing up on its hind feet, a Black Bear can be up to 7 ft tall. Females are on average about 33% smaller than males. Females weigh between 100 and 400 lbs; males usually weigh between 150 and 600 lbs. Adult black bears can reach 660 lbs, but exceptionally large males have been recorded from the wild at up to 8 ft long and at least 800 lbs. The biggest American Black Bear ever recorded was a male from North Carolina that weighed 880 lbs. It has an excellent sense of smell. Though they generally have shaggy black hair, the coat can vary in color from white through chocolate-brown, cinnamon-brown, and blonde (found mostly west of the Mississippi River), to black in the east (the same is generally true in Canada, the border being between Manitoba and Ontario). They occasionally have a slight V-shaped white chest blaze. The tail is about 5 inches long. Black bears are found in a wide variety of habitats across their range. They prefer forested and shrubby areas but they are also known to live on ridgetops, in tidelands, burned areas, riparian areas, agricultural fields, and, sometimes, avalanche chutes. Black bears can be found from hardwood and conifer swamps to the rather dry sage and pinyon-juniper habitats in the western states. Black bears typically "hibernate" during winter in hollowed-out dens in tree cavities, under logs or rocks, in banks, caves, or culverts, and in shallow depressions. Dens are normally not reused from one year to the next. While they do not eat, drink, defecate, or urinate during hibernation, it is not the true hibernation of smaller mammals since their body temperature does not drop significantly and they remain somewhat alert and active. Females give birth and nurse their young while hibernating. Black bears are omnivores whose diet includes plants, meat, and insects. Their diet typically consists of about 10-15% animal matter. They are apex predators in North America, with the exception of areas where they coexist with the brown bear. The black bear eats a wide variety of foods, mainly herbs, nuts and berries. In some areas, Black Bears share their range with the Brown Bear. Due to their smaller size, Black Bears are at a competitive disadvantage against Brown Bears in open, non-forested areas. Although displacement of black bears by Brown Bears has been documented, actual killing of Black Bears by brown bears has only occasionally been reported. The diurnal (movement in the morning and evening) Black Bear's habit of living in heavily forested areas as opposed to the largely nocturnal brown bear's preference for open spaces usually ensures that the two species avoid confrontations in areas where they co-exist. Black Bears also co-exist with cougars and may compete with them over carcasses. Like Brown Bears, they will sometimes steal kills from cougars. One study found that both bear species visited 24% of cougar kills in Yellowstone and Glacier National Parks, usurping 10% of carcasses. However, Black Bears and cougars rarely engage in violent combat with each other and usually try to scare each other with bluff charges, growls, swipes, etc. 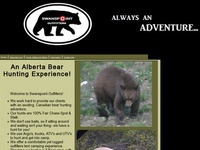 An Alberta Bear Hunting Experience! We work hard to provide our clients with an exciting, Canadian bear hunting adventure. Our hunting zone is located in north-central Alberta, there is little local pressure on these bears as it is a non-baiting zone. The terrain that we hunt varies from muskeg to high ground, all within the boreal forest. It is a 100% fair chase, spot and stalk hunt. The zone we hunt is a 2 Bear area, with no trophy fee for the second bear. You will have an excellent opportunity to harvest a color phase bear. We hunt an area where you may encounter moose, deer, wolves and Grizzly Bear. We pride ourselves in providing a "different" kind of bear hunt and offering an amazing hunting adventure! We use Argo's, ATV's, UTV's and 4x4 Trucks to get you to and around our hunting ground. We hunt in open cut blocks, cutlines, as well as old logging roads and oilfeild roads. Our camp is located in the bush and allows quick access to fantastic hunting ground, AND allows you to experience first hand the beauty of nature and the wilderness that our country has to offer! Our camp is just that, a camp. It is rugged, but at the same time comfortable. We do have a portable shower facility to use to clean up after a full day of hunting. All of the meals are home made and prepared at camp. We sleep on cots in outfitters tents with two hunters per tent unless previously arranged. The tents are heated with wood stoves to keep you warm and cozy throughout the night. Our hunts are 6 days long, from Monday to Saturday. We provide transportation to and from the Edmonton International Airport. We also provide a hotel room in Barrhead the Sunday night before the hunt and the Saturday night after the hunt. Gun and Bow hunts in Maine, Alaska, Idaho, British Columbia, Ontario, New Brunswick, Canada, and more.